Late one night in September 1866, eight young men approached Sanjō Bridge, intent on vandalism. Over the past two weeks, government officials had repeatedly raised a sign at the bridge declaring the Chōshū clan of Western Japan enemies of the Emperor. Twice now it had been torn down and thrown in the river, but two days before, that same grievous insult had been posted again. These young men, allies of Chōshū, meant to tear it right back down. As soon as they did so however, there was a shout from a nearby huddle of beggars, who cast aside their rags to reveal their swords! It was an ambush! And the beggars were the famed and feared Shinsengumi swordsmen in disguise! In the fight that followed three of the Chōshū allies were cut down and killed and the rest were forced to run for their lives. 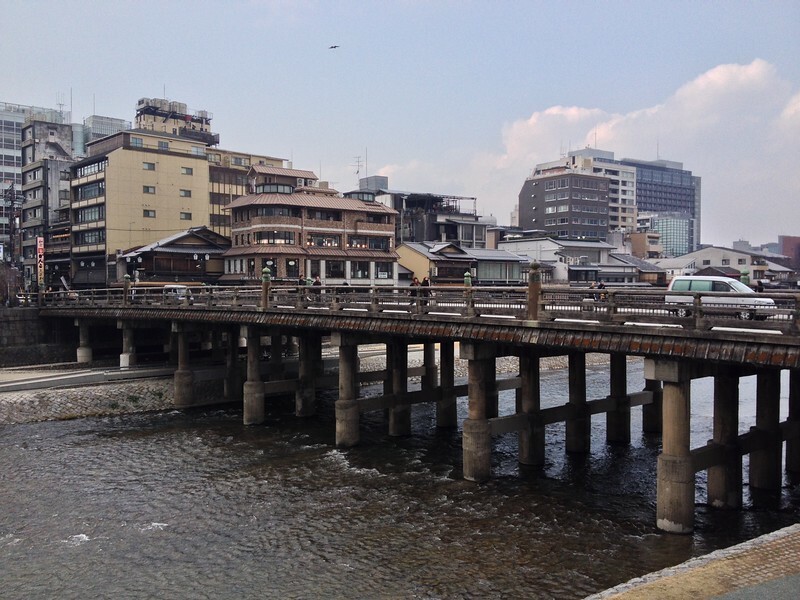 Today Sanjō Bridge is a busy thoroughfare in the center of a peaceful city. At the site of the skirmish there is now a Starbucks Café. Sipping a latte and gazing over the Kamo-gawa River, it is hard to imagine such scenes of violence. In the mid 19th century though, Japan was wracked by political instability. Kyoto, the imperial capital, was a hotbed of conspiracy and intrigue. Ambushes, assassinations and outright battles frequently erupted on the streets. 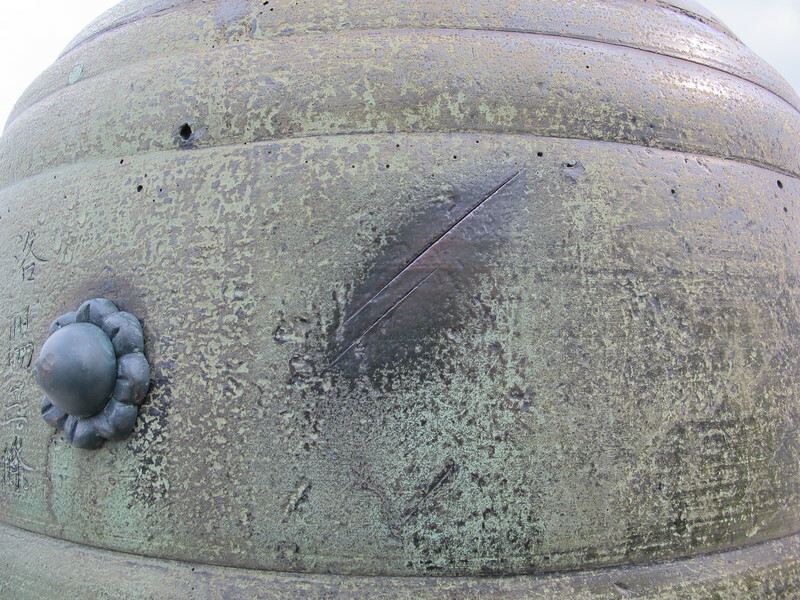 Some traces of these battles remain. 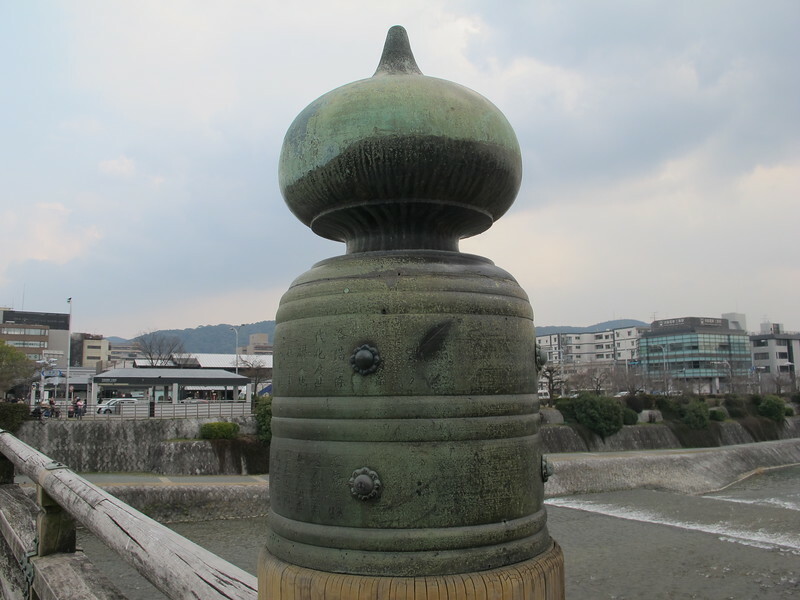 On the south side of Sanjō Bridge, one of the finials (those ornamental orbs that decorate the top of the bridge), is said to bear the scars of samurai swords. Those scars were left in another battle however, which I shall tell you about below. In Japan, the period between 1853 and 1867 was a time of intense civil strife now known as the Bakumatsu: the end of the Tokugawa shogunate. For over 250 years the Tokugawa Shoguns had presided over a feudal military government. However, the national government had become weak and regional clans wanted change. The Shinsengumi and the Chōshū clan were just two of many groups caught up in these years of turmoil, but they fairly represent the two political extremes. The Chōshū clan were imperialist and anti-shogunate. They wanted a new system of government with the emperor restored as head of state. On the other hand the Shinsengumi were an elite group of swordsmen sworn to defend the shogunate. Both sides were prepared to die for their beliefs. Although the Shinsengumi were ultimately on the losing side in this conflict, their fame as tragic heroes lives on. Initially employed to police the capital and keep the peace, they in fact became a ruthless band of assassins. In legend however, they are remembered as idealistic young men caught on the wrong side of history. The most famous incident associated with the Shinsengumi took place just a short walk away from Sanjō Bridge on July 8th, 1864. The story is that samurai from the Chōshū clan were planning to set fire to Kyoto, and use the ensuing confusion to attack their enemies. 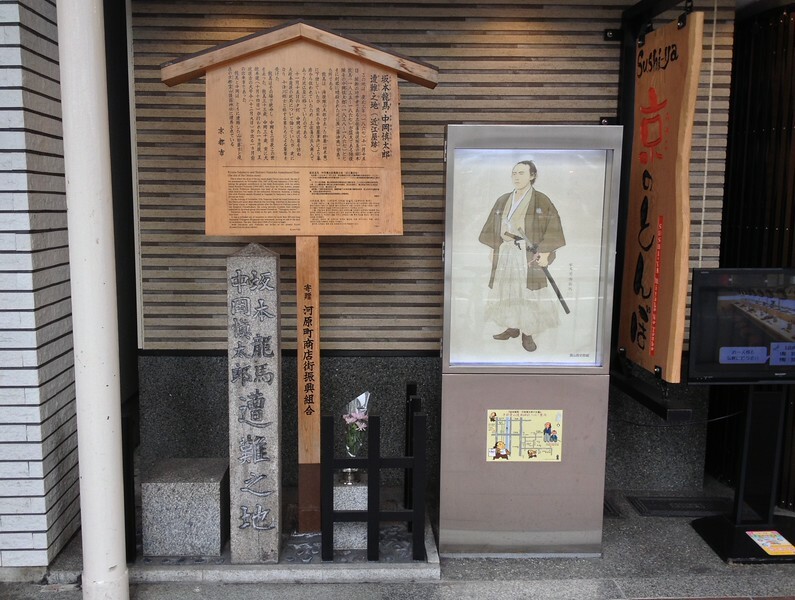 Having uncovered this plot, a small band of Shinsengumi led by Kondō Isami attacked the Chōshū conspirators at the Ikedya Inn. Initially, the Shinsengumi were heavily outnumbered, but they fought bravely until reinforcements came, and after a two hour struggle they had killed eight and arrested twenty-three of their Chōshū enemies. At one point the fight spilled out onto the streets and this is when those cuts were made on Sanjō Bridge. This fight was a terrible setback for Chōshū and a great victory for the fearless Shinsengumi, who were lauded for having saved Kyoto from fire. In those days every building was made of wood, so a fire would have been devastating. Today the Ikedaya is a Shinsengumi themed restaurant, with friendly waiting staff dressed in Shinsengumi style uniforms: a light blue haori jacket and a headband that reads makoto or “sincerity”. 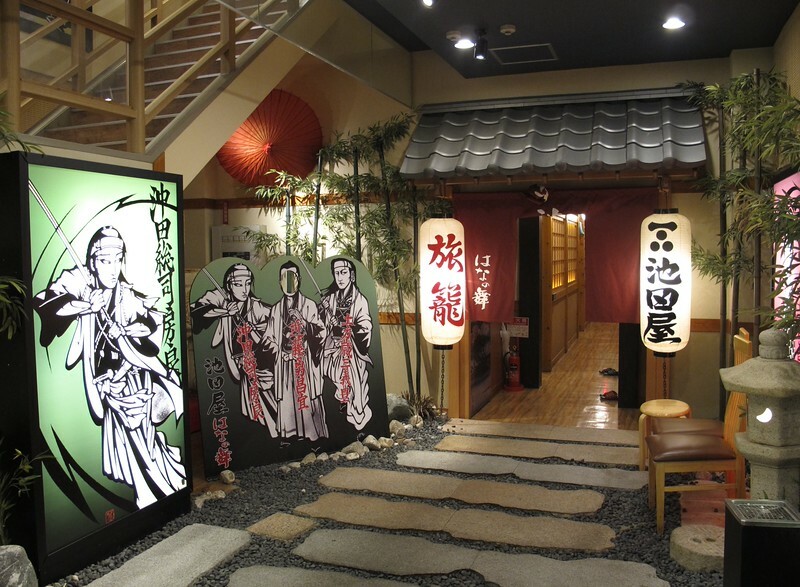 The interior of the restaurant is decorated with manga style depictions of well-known Shinsengumi characters, and even has some historical artifacts on display. Most importantly, the food at the Ikedaya is excellent. I particularly recommend the Sanjō Yosedofu: a deliciously creamy variety of local tofu eaten with ginger and soya sauce. You should also try the nama-fu: skewered blocks of gluten grilled on a mini-brazier at your table and then dipped in miso sauce. There are pictures of every item on the menu so it is super easy to order. A meal for two with a couple of drinks will set you back around 5000 yen, which is pretty good value. I would recommend booking the restaurant in advance, particularly on weekends, as they only have 30 seats. Ask your hotel receptionist to book it for you, if you are not confident about your Japanese. Ikedaya Hana no Mai is located on the north side of Sanjo a short walk west of Kiyamachi Street. There are a number of Bakumatsu samurai sites that can be easily taken in and combined with a stroll through Southern Higashiyama. 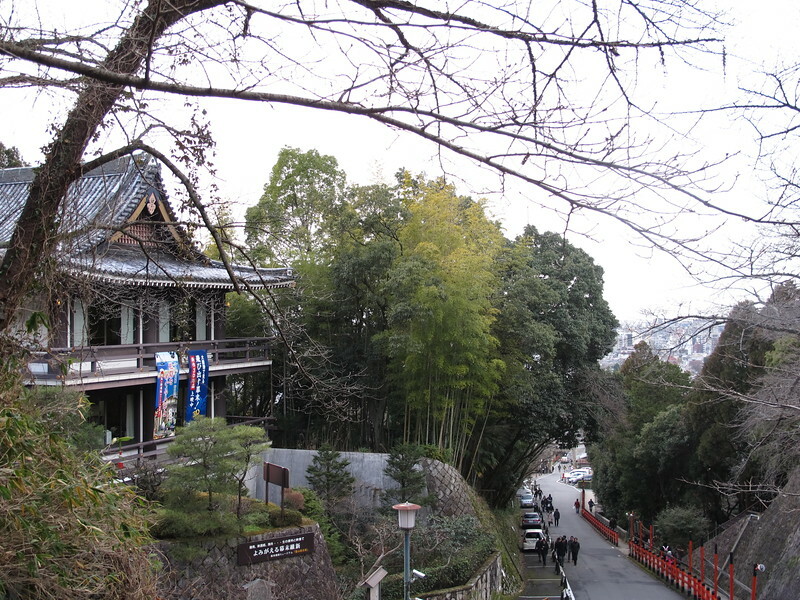 The following locations lie between Kiyomizu-dera temple and Maruyama-koen Park. 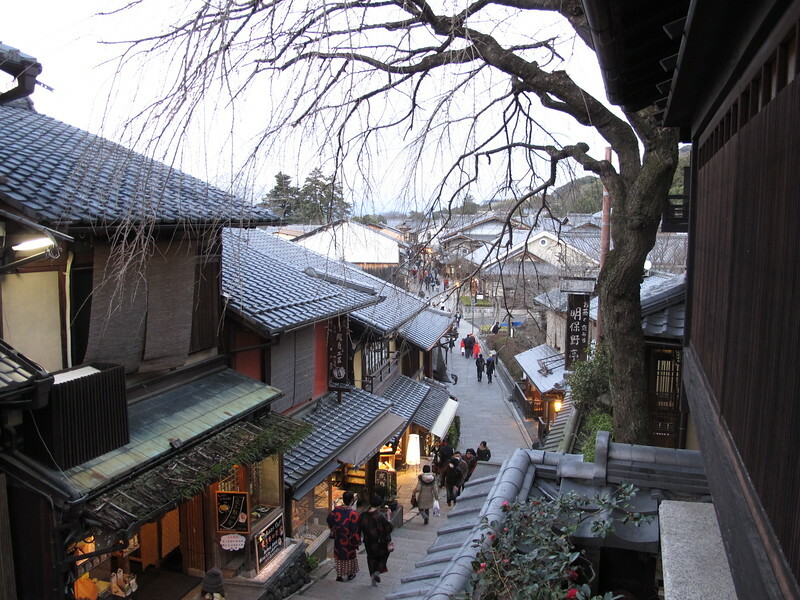 Descending from Kiyomizu-dera Temple, go down Sannen-zaka lane. With its beautifully preserved tea-houses this is one of the prettiest areas in Kyoto. Look out for the Akebono Tei teahouse on your right. There is a large 400 year old cherry tree outside which makes it fairly easy to spot. Here in June 1864, the Shinsengumi attacked a member of the Tosa clan by mistake! They actually thought he was a Chōshū clan member, and later one of the Shinsengumi would have to commit seppuku (ritual suicide) to apologize for their error. 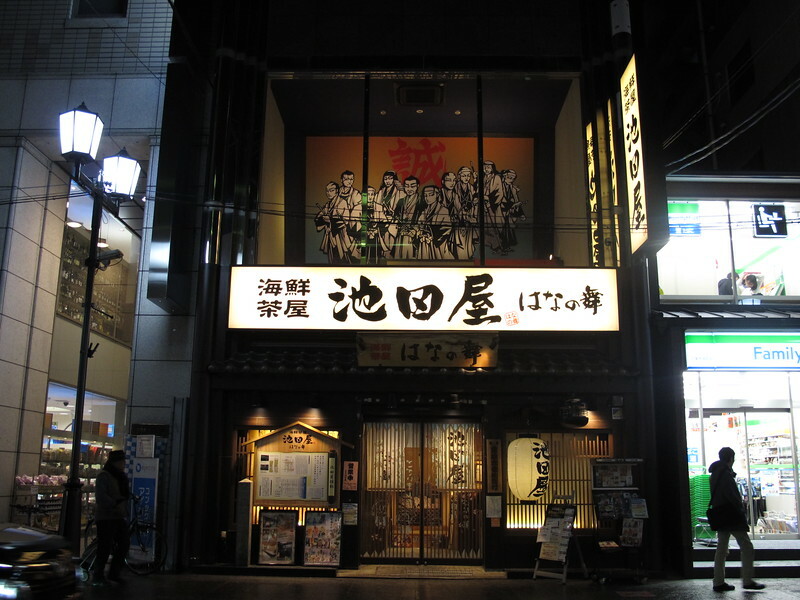 More importantly, the anti-shogunate activist Sakamoto Ryōma was a frequent customer here. Ryōma was a lone wolf figure, working beyond clan loyalties for his vision of a unified, modern Japan. He knew that regional clans would have to work together if they wanted to overcome the shogunate. His greatest achievement was negotiating peace between clans who were traditionally enemies. 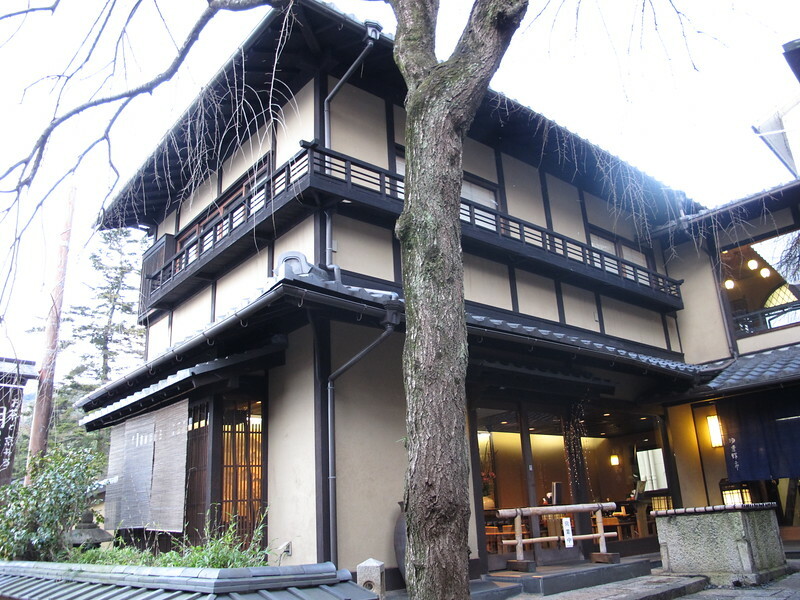 Many such secret negotiations took place at this teahouse, and so his picture is proudly displayed on the wall by the entrance. From Sannen-zaka continue on down the picturesque Ninen-zaka lane, and then take a sharp right up the hill. This road and the shrine at the top are dedicated to the memory of those who fought and died in the Bakumatsu. Named Ishin no Michi or Restoration Road, it’s quite a stretch of the legs, but it is worth it for the view at the top. As you go up, watch out on your right for the stately Suikokan building. It is a private building, so you can only view it from the outside, but a sign gives some historical background. Samurai from the Chōshū clan and other imperialist revolutionaries would often meet and plot here. Continue up until the top. 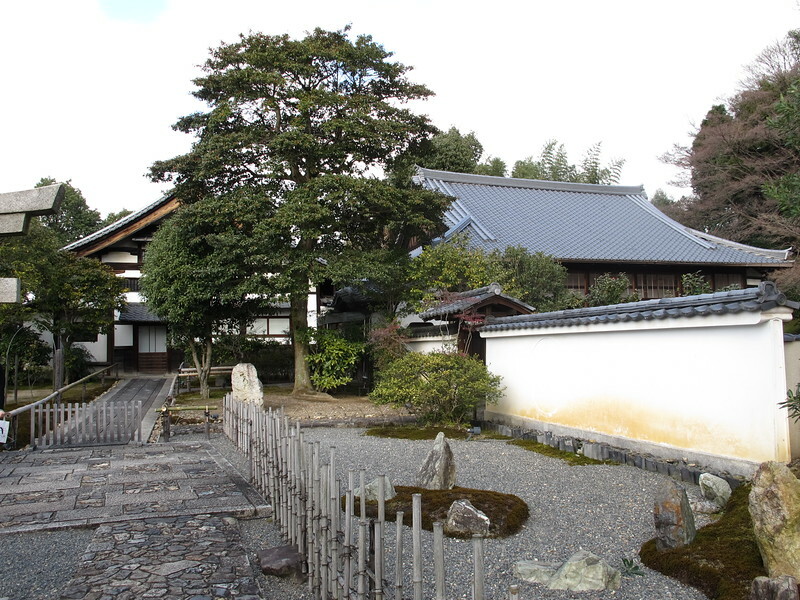 On your left is the Gokoku Shrine and on your right the Ryozen Museum of History. Go into the Gokoku Shrine and pay the 300 yen entry fee for the cemetery. Here lie hundreds of samurai who died fighting for the restoration of imperial rule. Among them the way to Sakamoto Ryōma’s grave is clearly sign-posted. 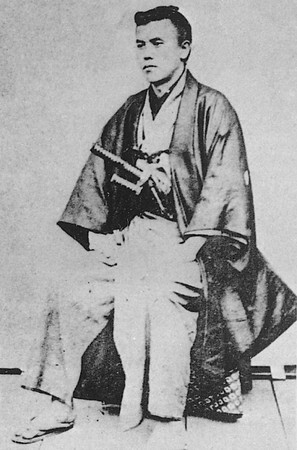 Sakamoto Ryōma is a revered figure in Japanese history. A true national hero, he gave his life for his vision of a modernized, democratic Japan. He was assassinated in December 1867, just one month before the restoration of imperial power. During the Meiji era that followed, Japan would see rapid technological and political change. Palanquins would be replaced by trains, candles by gaslight and a feudal system of clan loyalties would give way to a constitutional democracy. 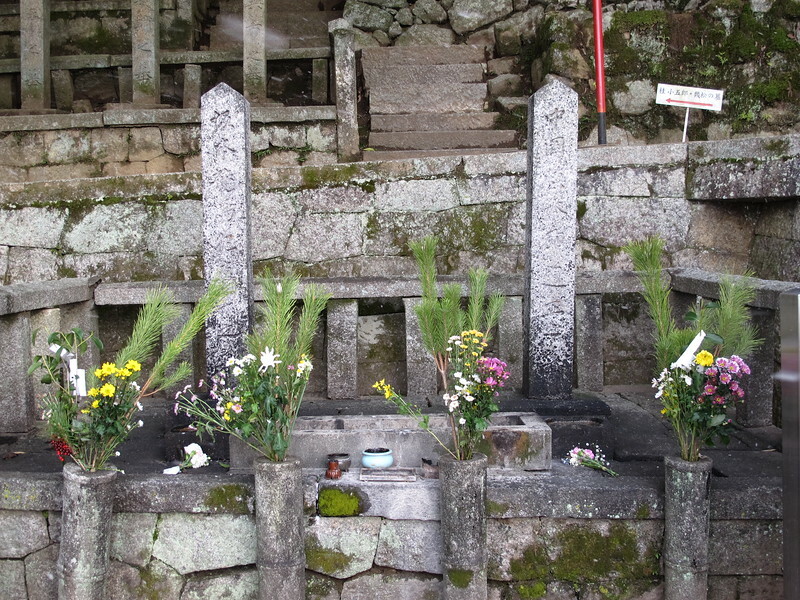 Ryōma never saw all this progress, but today many people visit his grave to give thanks and pay their respects. 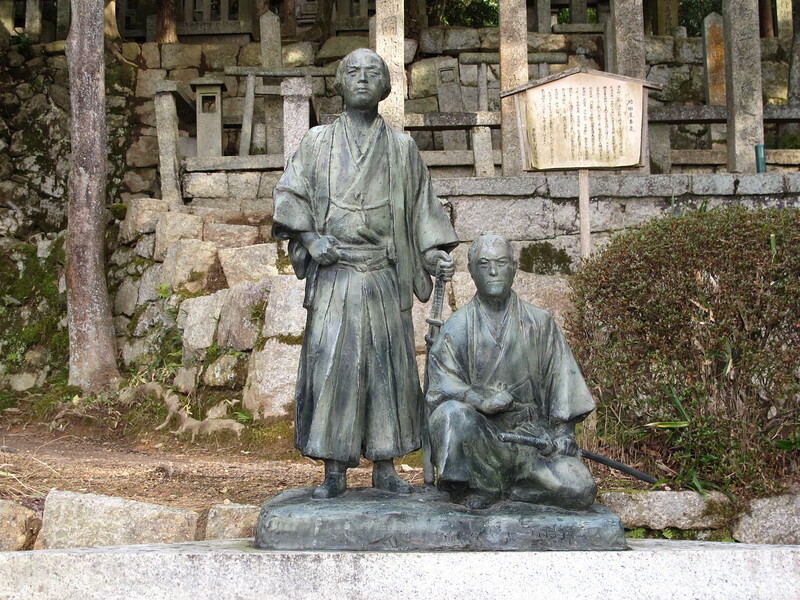 Nearby, a statue of Ryōma and Nakaoka Shintaro, a close friend who died with him, look out over the city. On a clear day the view from this spot is spectacular. 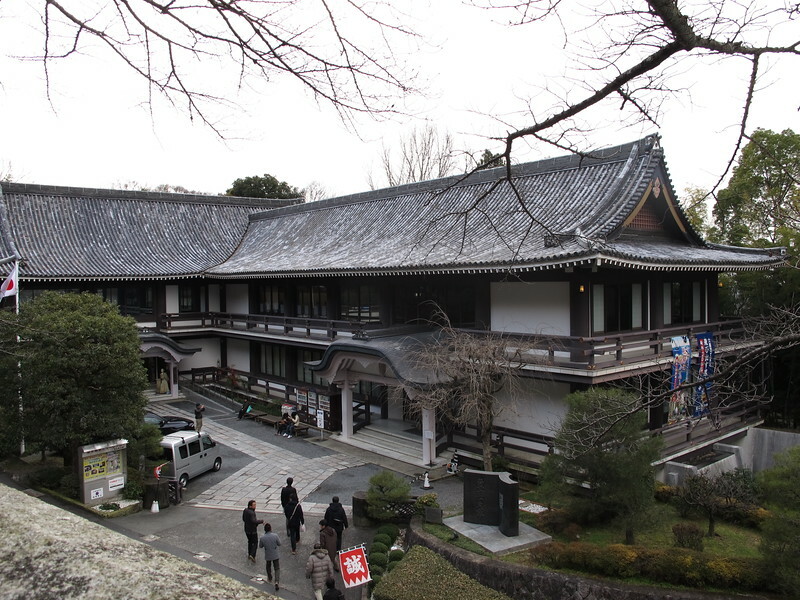 The Ryozen Museum of History is dedicated to the history of the Bakumatsu period. Inside you can find dramatic miniature dioramas depicting events such as the Ikedaya incident and the assassination of Sakamoto Ryoma. 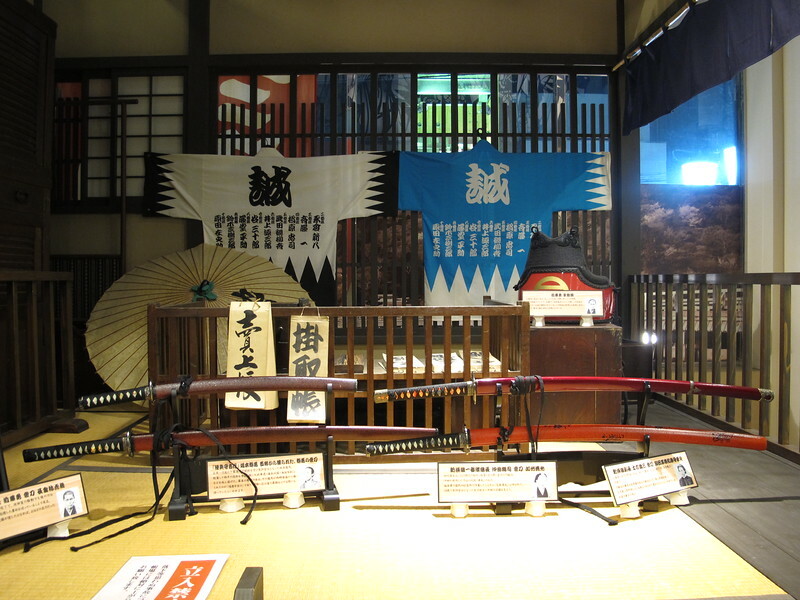 There are many historical artifacts: letters, poetry and calligraphy of the Shinsengumi. There are rifles and shells from the period that you can pick up and touch. There is even a sword that is said to be the one used to murder Sakamoto Ryōma. Unfortunately, almost all the information is in Japanese and the entry fee at 700 yen is a little steep. To save you the expense, check out the timeline of key Bakumatsu events at the end of this article. And for more historical background, watch the 2003 movie When the Last Sword is Drawn. This award-winning, action packed film is set in Kyoto, and tells the story of a Shinsengumi samurai who is torn apart by conflicting loyalties to family, clan and country. It is a deeply moving tale that gives a real feel for the times. Return back down Restoration Road and turn right onto Nene-no-Michi Lane. This beautiful flagstone strolling area leads you to the well-known attractions Kodai-ji Temple and Maruyama-koen Park. Look out on your right though, for the less well-known Gesshin-in Temple. 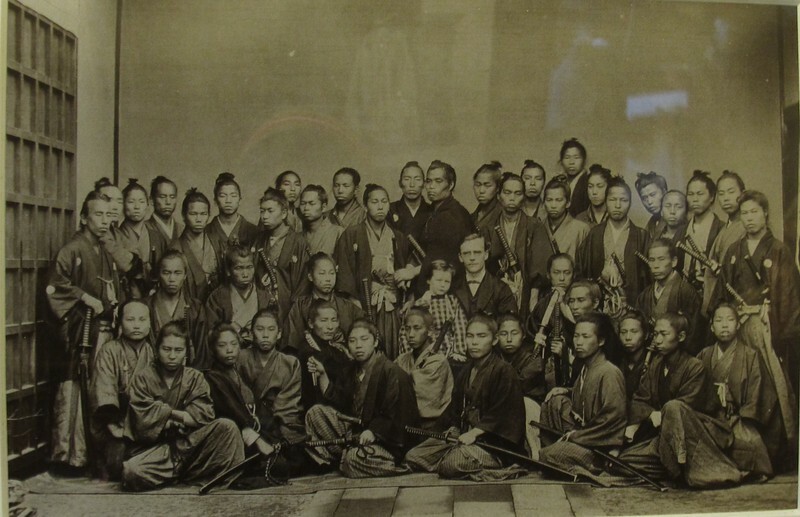 In 1867, Shinsengumi member, Ito Kashitaro defected from the group and formed a new imperialist squad called “The Guardians of the Imperial Tomb”. They made their base here at Gesshin-in. Step inside the temple gate and look at the quiet garden. Imagine those young ill-fated idealists practicing their swordsmanship here. It was all to be in vain. 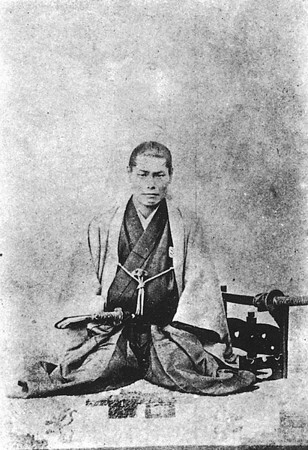 The rules of the Shinsengumi did not allow for defections, and within a few months Ito Kashitaro and several of his followers were ambushed and killed. Leaving Southern Higashiyama, head back into town through Maruyama-koen Park and Yasaka-jinja Shrine. Walk west along Shijo until you come to Kawaramachi Street and then head north on the west side of the road. Just before the first turning on your left there is a sushi shop. 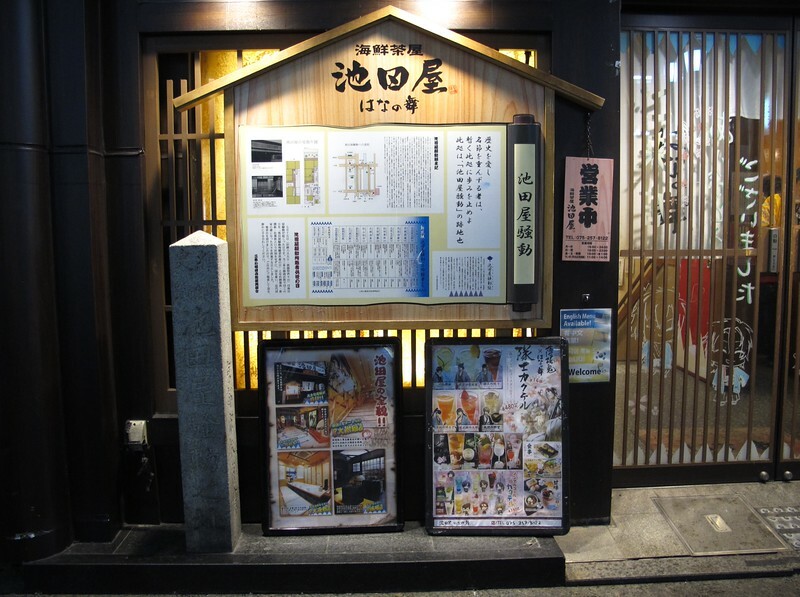 Outside that shop is a memorial stone and sign dedicated to Sakamoto Ryōma. 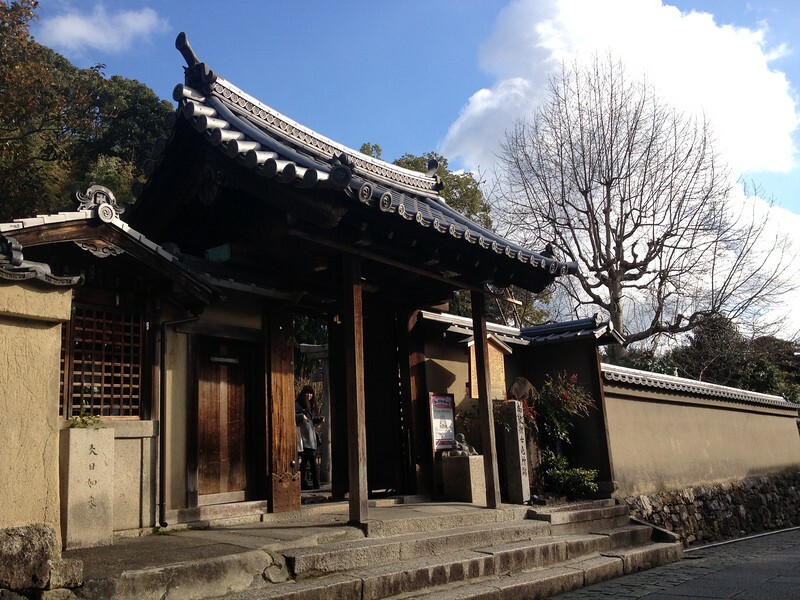 This was the site of the Ōmiya Inn where Ryōma took refuge in the last days of his life. Knowing his life was in danger, he moved here believing the location was secure. On the night of December 10th, 1867 however, a group of assassins stormed the building and caught both Ryōma and his friend Nakaoka Shintaro by surprise. Nakaoka Shintaro died a few days later and Ryōma died that night. It was Ryōma’s 33rd birthday. No one knows for sure who killed them. At first the Shinsengumi were blamed and their leader, Kondō Isami was executed for his part in the conspiracy. However, another group of shogunate loyalists later claimed responsibility. There is even a theory that imperialist revolutionaries had Ryōma killed. In the interests of peace, Ryōma had supported including the Shogun in a new government, and this had made him a whole new set of enemies. When I visited this location to pay my respects, an old man suddenly stopped and spoke to me. He insisted on taking me into the sushi shop that stands on the Ōmiya Inn. Inside on the stairway was an old black and white picture of a group of samurai. 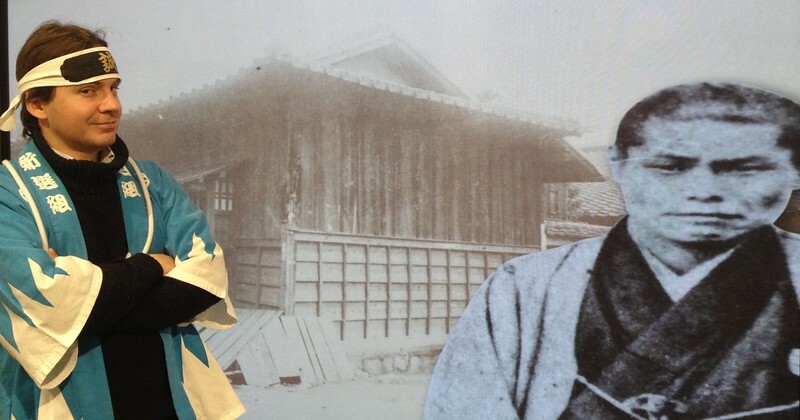 “These are the heroes of the Meiji Restoration,” he told me proudly, and then he disappeared back onto the street. Looking about me, I wondered what Ryōma would have thought of the conveyor belt of sushi in the brightly lit restaurant. As a man who gave his life to bring Japan into the modern age, he may well have been delighted. To put everything into a proper historical perspective here is a simple timeline of some key Bakumatsu events. 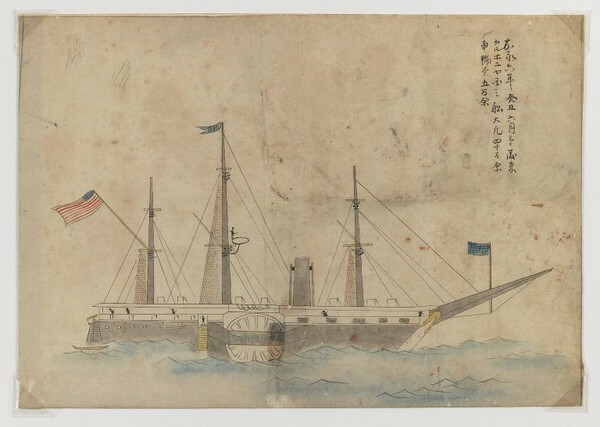 American ships under the command of Commodore Matthew Perry arrive in Japan. The feudal Tokugawa shogunate had kept Japan closed to the outside world for over 200 years. Recognizing the superior military technology of the American navy, the shogunate agreed to open its ports to foreign trade. This decision was unpopular in Japan and weakened the Tokugawa shogunate. Several clans are plotting against the shogunate and calling for direct imperial rule. Political violence is rife. 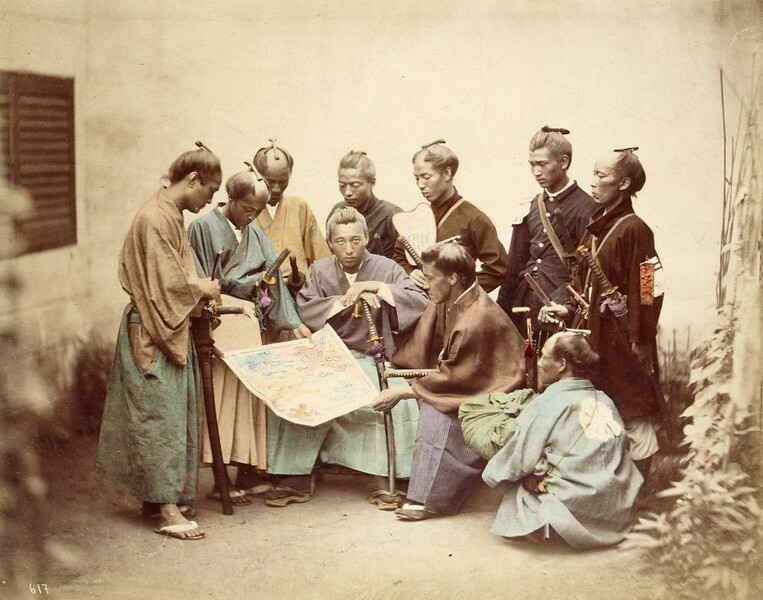 The Shinsengumi are formed and charged with policing the capital of Kyoto. The Shinsengumi raid the Ikedaya and the Akebono Tei. In response the Chōshū clan try and fail to take the Imperial Palace. The Chōshū clan are expelled from Kyoto and forced to surrender to the shogunate. 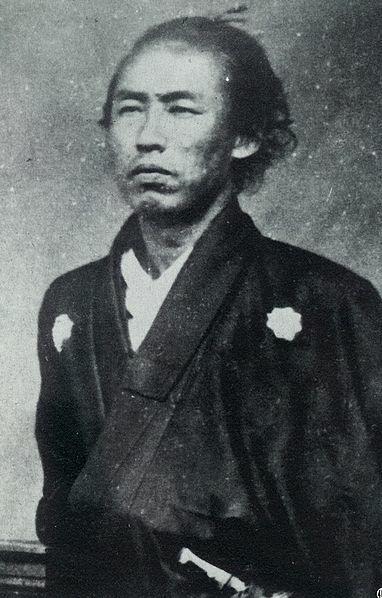 Sakamoto Ryōma helps to negotiate peace between the imperialist Chōshū and Satsuma clans. The Shogun officially resigns and hands over government to the Emperor. In reality he still retains some power. The Meiji Emperor makes a formal declaration of the restoration of imperial rule. The Battle of Toba-Fushimi. Shogunate forces are completely defeated in a battle to the south of Kyoto.